The number of things I won’t believe have plummeted…not because of scientific breakthroughs but simply because of the click bait that is taking over every piece of content we see out there. Every time I see content titled with the leading phrases, I suspend my disbelief and imagine and the most absurd scenario and then just move on. At the moment, this seems like the best way to counter. Even trusted news outlets and journals are using these headers to grab attention – everything is “jaw dropping”, “mind blowing”, “totally revolutionary”! It looks like it’s quickly becoming the new norm. How much longer will this continue until we are completely desensitized? Also, do the brands often sponsoring this content realize this is actually damaging their image? Is a click-through worth it when the person thinks the content is useless? The question I am thinking about – what will be the next thing that will drive such high levels of consumption and click-throughs? Is Google Glass the real product? In all it’s glory of features and use cases and abuses, Google Glass has made a huge impact in our community, way beyond the lives and dreams of nerds and geeks (such as myself). We have been looking at Google Glass as the product but what if it’s not? What if it’s simply a stepping stone for Google to get to the real deal – to test out the concept. Similar, but with a much bigger end goal, to how iPhone was a stepping stone for iPads – Glass just might be the stepping stone, a testing ground, for an Always On society. 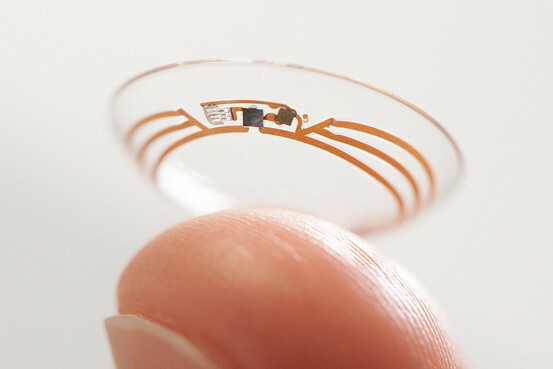 This can be further supported by the patents and development of the contact lenses (WSJ article). An idea I had emailed to Microsoft in 2012 about a high end, clear/transparent landline phone. Still hasn’t come to fruition and would still be worth making. I just had an idea for a phone that would be a rather futuristic design and could be marketed for the high-end market. The idea goes along with the revolution of having transparent things, with the Dell Monitors and TVs with clear sides. I think a “transparent” or “clear” phone would be a next step in the same direction. To what extent the phone will be transparent is up for design purposes but I do have some idea in my mind as to what would be appealing. But more importantly, you must be wondering, if the phone is transparent, how can you see it? How can you use it? The phone is in fact a touch panel screen, and so the phone can be used by just tapping the phone instead of it having buttons on there. Next question: How can you use it, if it’s transparent? It will be difficult to read what is on the touch screen if the screen is transparent and there are things behind the phone. The answer: The phone is equipped with an infrared sensor (or whatever motion sensor is appropriate), to detect movement around it. So when someone brings their hand close to the phone it will detect the movement and the phone (screen) will turn dark and you will be able to see the buttons and other options on there. Additionally, it will also turn dark and display call information if there is an incoming call. Well, that’s it…that’s my idea. Not sure if the current level of technology can do this. Or if this is cost efficient? But I know a LOT of rich people will be willing to pay big bucks to have this in their homes and offices. Lastly, please let me know if you plan on pursuing this idea because it would be nice to know I made a difference. Should recruiters know about company strategy in great detail? This is a recent phenomenon I have noticed (or maybe its only post university recruiting) where recruiters are asked questions about company strategy. Is this an appropriate line of questioning for the questioner to hassle the recruiter with? Are they looking to impress? Does it impress a recruiter when they are asked very detailed questions about what the company is doing in a specific sub-sector? Most recruiters struggle with these questions. It is frustrating to not hear an answer for the questioners but I have realized it may not be in the job description. It is important though considering they are the first filter for the talent that will align with the company goals. Yes, they may just be seeing culture fit but they are still reviewing CVs. Furthermore, they are still employees of the company and more so externally facing so they are bound to be asked. Nonetheless, companies have numerous arms with their own strategy and reasoning for them. Thus, asking very specific questions is bound to not be answered appropriately. Maybe a follow-up email with the question would be a better avenue. Recruiters – please DO NOT answer these questions with extremely vague answers because it looks worse than the person asking a 2 minute question drilling down into a sub business unit’s PNL line item 4 historical trend and how that is impacting your current strategy. DO learn your company’s high-level strategy and where the company is going in the hot sectors or operates in. Where the heck is the delete key? Yes I get you can Fn + Delete but that’s crazy and a waste of time. The different ‘dashboards’ useful at times can be quite excessive. 1) The MacOS is not quite ‘prettier’. I am not sure why this has been such a claim but it is quite disappointing. 2) Why doesn’t the screen tilt back further? This is an idea for Google Labs: Google Dialog. The service would transcribe audio into text. Google could accomplish this by expanding their Google Voice to Text technology to further recognize and distinguish voices of individuals rather than just considering it all just one person speaking. I use Google Voice as my voicemail currently and quite rarely do I have no clue what the voicemail is about after reading the transcription. Nonetheless, I would expect this service to be better at going from voice to text. It might be a good idea for Google to acquire Nuance Communications (Dragon Dictation and Search apps maker) since their voice to text is quite accurate. There are other companies trying to develop similar technology but I believe with Google’s resources, this can be accomplished considerably faster and distributed over numerous mediums. I have owned the Jawbone ERA (bluetooth headset) by Aliph for about a month now so I wanted to write-up my review of the product. To summarize the comments below – Great product (as usual) with a few pain points. I have just listed specs and features all in one since it would have been too much trouble to separate it all out. Pro – Feels more substantive. Doesn’t flap around on your ear or fall off when you chew. I can run with it on without worrying about it falling out. Con – Ear gets tired if I wear it for too long. This is a combined effect of the shape of earpiece as well, I believe. Earpieces – The package comes with a new type of earpiece as well as the traditional one. Pro – The new ear piece is a better shape for ears since hooks in a bit further than the round surface of the regular earpieces. Pro – The new style is better at noise cancelling of current environment since it’s more snug in my ear. Con – The medium one is a tab bit too large for my ear so it starts hurting my ear after a while of continuous use. Pro – The new earpiece is better at noise cancelling of my environment since it’s more snug in my ear. Pro – The noise cancelling for others receiving my calls appears to have improved as well. Con – Sometimes it’s too difficult to hear the a call on the earpiece but I can hear them on my handset. Not sure why. Con – Sound on my side sounds a bit morphed at times. Pro – Looks more solid and intentional when worn rather than something that is just hanging off of an ear by mistake. Apps and updates – A brand new feature allowing user to update their Jawbone and add new features on there. For ex: change the voice, favorite number, caller name announcement, etc. Pro – It’s awesome that the device can actually be updated and you can add new apps on it. It’s not static anymore and can’t be easily outdated. Con – Apps are limited at the moment but that is expected since the idea is still rather new. Con – The caller name announcement feature doesn’t repeat the name of the individual. It would just say “Call from Mike” once and stop there. So if you didn’t catch it the first time, too bad for you. Pro – Jawbone claims 5 hours and it’s pretty close to that. Pro – It recharges very quickly. I haven’t timed it but I am approximating anywhere between 30 mins to 1 hour to fully recharge. Hanging up – There is touch sensor on the device and if you double tap it will hang up the phone call. Con – It is not too sensitive so sometimes it’s a bit difficult to hang up that way. # Announcement – This has been there since two Jawbones ago but an awesome feature where the number calling you actually spoken to you. Pro – You don’t have to look at your phone all the time to determine who is calling. Obviously this requires you to remember people’s phone numbers. It might actually be helpful in improving memory. Battery Bar – On the iPhone and other smartphones you will see a bar that displays the amount of battery remaining. Let me know if you have any questions or need me to expand on a certain area more.